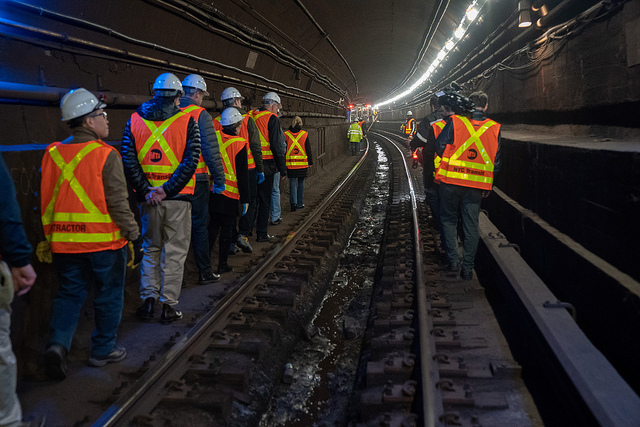 As you know, Governor Cuomo announced earlier this month that instead of a 15-long total shutdown of the Canarsie Tube to repair damage sustained during Hurricane Sandy, the MTA will close just one tunnel at a time during nights and weekends. Many are celebrating the decision, made after a Cuomo-appointed team of engineering academics concluded, among other things, that the tunnel’s benchwall, which houses cables damaged by salt water during Superstorm Sandy, wouldn’t have to be replaced entirely; instead, cables could be suspended from the wall with a racking system. Among the issues discussed was today’s New York Times report that five years ago, the MTA considered a plan similar to its current one and rejected it due to safety concerns about, among other things, cancer-causing silica dust. Is the L-train shutdown definitely off? Is the new plan definitely happening? Trottenberg asked, “So if the [MTA] sign says ‘shutdown averted,’ it should have a footnote that says ‘Subject to board approval?’” Ferrer’s answer was inaudible, since he had turned off his microphone. It seems that even members of the MTA board are still confused about whether or not they have veto power over the new plan being pushed by Cuomo. Will someone other than the MTA and Cuomo’s team of academics weigh in on the plan? Benjamin Solotaire— a member of the L Train Coalition representing businesses and residents of Williamsburg, Bushwick and beyond— said the coalition wants to see “an independent engineering firm weigh in on the plan and evaluate the safety for the public.” Ferrer announced that, indeed, “a new third party consultant will be engaged to report to the MTA board, coordinate the construction with the ongoing train operations and make sure the transition from construction to operation is seamless.” The independent consultant, to be chosen by the board, will also make sure safety and environmental standards are observed. What will happen with the current mitigation plan calling for more trains, ferries and the like? Solotaire also said the L Train Coalition wants to see “serious consideration of all the proposed transit changes that were part of the original [15-month shutdown] plan including new bike lanes, Citi Bike expansion, new ferry service, the expanded and improved subway service, and Select Bus Service”— a view shared by City Council member Antonio Reynoso, whose district includes parts of Williamsburg and Bushwick. In the 2014 report obtained by the Times, engineers at Parsons Brinckerhoff (now, WSP, the firm overseeing the new plan) said that mounting cables to the tunnel wall instead of burying them inside of it would spread potentially cancer-causing silica dust. Is this no longer the case? Jerry Janetti, senior vice president at WSP, said that the new plan is “not similar to plans that were done earlier or reviewed.” He said that whereas the plan reviewed in 2014 called for cables to be fixed to the tunnel with 50,000 individual bolts, the new one called for “40% or less” that number of bolts. Whereas a previous proposal would have removed the entire bench wall that houses damaged cables, Janetti said that, under the new plan, at least 60 percent of the bench wall has been deemed good enough to remain as is. The remaining 40 percent will either have to be removed, or strengthened with FRP (Fibre-reinforced plastic, which was used in the 7-line extension to Hudson Yards), cementitious materials, or steel bars. The damaged walls are currently being evaluated so that a specific plan of attack can be put into place. The 2014 report worried that “excessive anchor bolt penetrations for installing critical cables may damage the concrete lining and induce leakages.” Is that no longer the case? Is the Times correct that both the current and previously rejected plan “call for mounting heavy cables”? With power and communications cables exposed rather than buried in the tunnel wall, will terrorists or vandals have easy access to them? Ferrer said no, the new fiber-optic sensor system would “give us an ability to see if someone unauthorized is in the area” and essentially serve as an intruder alert. Will the silica dust be cleared from the tunnel in time for the morning rush hour? How? Had the racking system been previously considered? The MTA has been touting the pros of the new plan. What are the cons? How long will the repairs last? Cuomo’s team of experts have said they could last 40 to 50 years. Ferrer and others echoed that number but stressed that it depended on proper maintenance and whether or not another catastrophic event such as Sandy occurs. Why didn’t the MTA get these options sooner? Why were they only suggested by a team of academics appointed by Governor Cuomo?